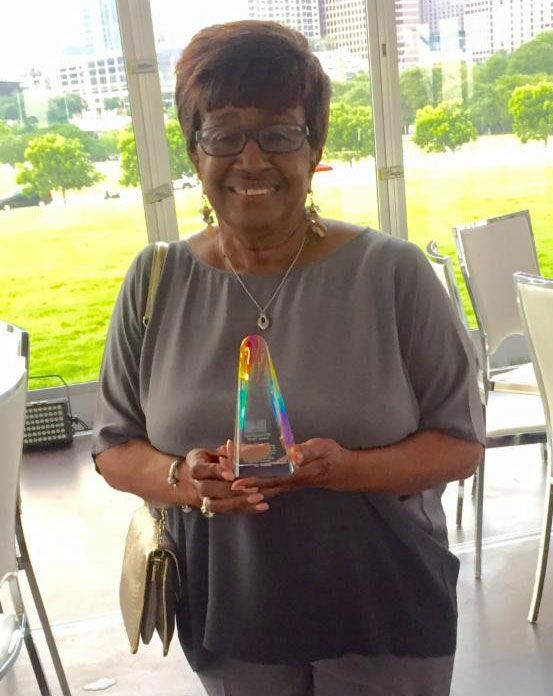 Dance/USA, the national service organization for professional dance, honored Dallas Black Dance Theatre founder Ann Williams with the ‘Ernie’ Award at its 2016 Dance/USA Annual Conference in Austin, Texas on June 8-11, 2016. The conference honored Ms. Williams along with award winners in other categories, Jawole Willa Jo Zollar, Ella Baff and Sarah and Ernest Butler, at the Opening Night Celebration on June 8, 2016. Williams founded Dallas Black Dance Theatre (DBDT) in 1976. Under her direction the dance company grew from a community-based, semi-professional organization into a professional dance company. In addition, the DBDT has developed semi-professional DBDT II, as well as Dallas Black Dance Academy, with its three performing ensembles. The permanent home of DBDT is the historic Moorland YMCA building in the Dallas Arts District located on a street named after Ann Williams.The company’s yearly performances and outreach activities have grown from 30 to over 600 services spanning the United States and international venues. The audience growth has increased from 20,000 to 150,000 annually. Having performed at two Olympics, DBDT’s outreach is now on a global scale. To date, the dance company has toured in five continents, 15 countries, and 31 states. Ms. Williams is a founding member of the Dance Council and The International Association of Blacks in Dance. She serves on the Board of Directors of Texas Ballet Theater, The International Association of Blacks in Dance, the Texas Cultural Trust and Ursuline Academy of Dallas. She is a dance consultant and has served as a dance panelist for the City of Dallas/Office of Cultural Affairs, Texas Commission on the Arts, Dallas Center for the Performing Arts Foundation, Houston Arts Council, Arkansas Arts Council, the Corsicana PRIDE Project, and the National Endowment for the Arts. Ms. Williams is a graduate of Prairie View A&M University and earned a Master of Arts Degree in Dance and Related Arts from Texas Woman’s University. She holds a certificate in Arts Management from Texas A&M University. She also served six years on the Texas Woman’s University Board of Regents. She is a 2002 inductee into the Texas Women’s Hall of Fame; and in April 2005, she was honored at The Kennedy Center in Washington D.C. as a part of the Masters of African-American Choreography series.